Will my child benefit from therapy services at FAC? What makes FAC different than other therapy clinics? Does my child’s doctor get involved? Does insurance cover therapy at Family Achievement Center? What kind of outcomes can I expect? How will my child benefit? What role do parents and caregivers have in therapy at FAC? How long will my appointment be and how often? How is therapy at FAC different than school therapy or district services? If you have concerns about your child’s ability to function like other children their age, an evaluation is recommended. It is never too early to have your child evaluated! Children are highly responsive to pediatric therapy during the early years. Research shows that early intervention may prevent or lessen future problems. FAC also treats older children and adults who have not had therapy in the past or may have taken a break from therapy services. You are never too old to learn new skills or strategies to improve functioning. Family Achievement Center’s vision is to provide hope to families and improve lives. Unlike traditional pediatric therapy models, Family Achievement Center uses an innovative, family-centered approach. Our services integrate all aspects of the physical, occupational and speech therapy experience. Ultimately, we strive for our families to know that they are not alone, that Family Achievement Center’s core purpose is to share in their journey. 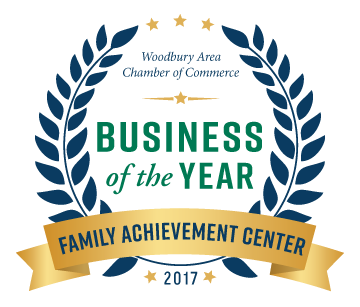 Family Achievement Center offers services and programs to clients in a state-of-the-art facility, conveniently located in Woodbury, MN. Clients experience an added benefit from Family Achievement Center’s unique facility and program offerings. Leveraging a holistic view of the child’s care team, our services extend to all vested parties. Family Achievement Center employees work one-on-one with children who face challenges with courage and resilience. At the same time, we partner with parents and caregivers to promote empowerment. To schedule an evaluation please call FAC at 651-738-9888. Prior to visiting FAC, we will need a referral from your doctor for your child’s therapy need (OT, PT, ST). Contact your child’s doctor to determine if they need to be seen for an appointment prior to coming to FAC for an evaluation. The referral from the doctor can be faxed to 651-738-9889. If you have questions about scheduling an evaluation, please do not hesitate to contact us. As stated above, your child will need a referral from their doctor prior to evaluation and treatment. The therapists at FAC communicate with doctors as needed and send them updated progress reports. FAC accepts many major insurance plans. If you have medical insurance and would like to receive the maximum benefits available, it is important that you contact your insurance company prior to your first visit. At FAC, we are available to answer any insurance questions you may have, however, we do not guarantee coverage or payment by your insurance company. The following questions may be helpful when talking to your insurance company: *Does my policy cover habilitative/rehabilitative therapy services for occupational, physical and/or speech therapy? *Do I need a prior authorization or an insurance referral? *Are there visit limitations for therapy services? *Do I have a detectable and how much has been met? *Do I have co-insurance for each visit? *Do I have an office co-payment for each visit? The duration and frequency are unique to each individual child and their needs. This is typically determined at the initial evaluation and is updated as the status of the child changes. High demand times such as after school and after 3 pm can have a waitlist for certain disciplines. The more flexible you are with therapy times, the faster you can get in! Family Achievement Center offers a “flexible schedule” option. This option allows a family to call on Friday and check availability for day/times the following week. This is a great option for families with changing schedules or waiting for a specific day and time. Talk with your therapist to see if an on-call or ‘flexible’ schedule is a good fit for your child. At FAC, we strongly believe in the therapist/caregiver relationship. It is important to consistently bring your child to their therapy appointments and consistently follow-through with your therapist’s home program recommendations. The collaborative relationship between the therapist and the parent helps to develop and facilitate functional and meaningful goals, home programming, appropriate and timely referrals when necessary and beneficial community contacts with other providers and caregivers working with your child. You and your child’s therapist will determine the best plan for parent involvement during the treatment sessions. In many cases, the more consistent the follow through is at home, the faster the child progresses. A skilled physical, occupational and/or speech therapist will meet with you and your child. The therapist will review the intake form and ask additional questions as needed. The child will then be evaluated using a standardized test and/or clinical observations. The information from the evaluation is used to come up with achievable goals individualized for your child. Speech therapy visits are typically 45 minutes and occupational and physical therapy visits are 60 minutes. Frequency of therapy is determined at the evaluation and is dependent on the child’s needs. Family Achievement Center makes the best attempts to fit therapy into your family’s schedule. For school aged children, school therapy is based on the educational model and addresses how a child functions within their educational environment. Often time, school and district services are less often than outpatient therapy. For both school aged and younger children, it may be more difficult to qualify for school/district therapy than outpatient therapy. Outpatient therapy at places such as Family Achievement Center, are based on a medical model and focus on treating the child’s needs in every aspect of their life. Outpatient and school/district services can be working on similar or different goals depending on your child’s needs and a child may benefit from both! Consistency of therapy is important to build and maintain skills. Inconsistent attendance may result is regression of learned skills. Also, insurance companies review attendance compliance when determining if they cover therapy services. Family Achievement Center has a 90% attendance rate and failure to reach this can result in a same day schedule.